I love the dress lol. What else can I say but, Wow ! I would have been screaming by the time I had stitched the veil! Thank you ladies. Big debate going on with myself at the moment lol. On the chart in the big blank space it say 'United in Marriage' with a space to put dates and names. Not bothered about leaving the names and dates out but not sure whether to put the 'United in Marriage' on it. Don't think I really want to as the 'U' takes up a space of over 50 x 50 squares and the other letter a minimum of 8 x 8 squares but the space does look a bit bare lol. Amazing work - I know how many hours it will have taken you. Personally I'd record names, dates and place of wedding, because as a family history buff that is what will be of interest to future generations. Just something I enjoyed Jan and thank you. I've decided to put 'The United in Marriage' bit in but leave the names and dates out. 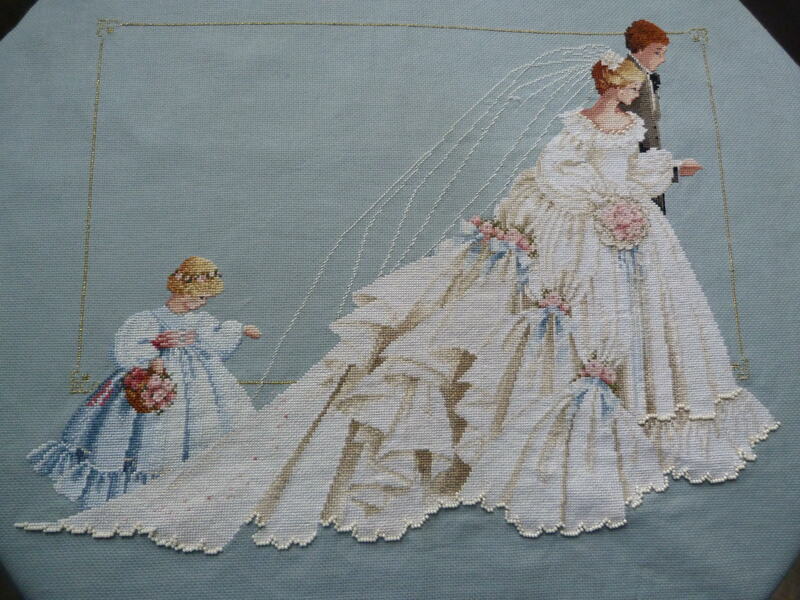 I bought 4 old charts all brides, this one and another one all done so still two to go lol. I really love anything with dress in especially historical. The charts I've got are all meant to be Victorian dress. Finding it a bit difficult to find different charts or kits now though.